Within our dedicated endodontic facilities, Dr Sukdev Singh and Dr Shuva Saha work with the latest obturation and canal preparation techniques. 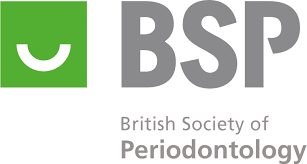 Dr Singh has been with us since 2006 and has had excellent results working at BPI Dental with hundreds of successful treatment outcomes . Dr Saha (Specialist in Endodontics) joined us in 2014. Both welcome referrals for all types of endodontic therapy; including root canal therapy, endodontic re-treatment, endodontic surgery, treating cracked teeth and treating dental trauma. The dedicated endodontic treatment room is equipped with the latest dental chair and also state of art endodontic equipment including a microscope. The Global Dental Operating Microscope provides improved illumination and magnification enhancing the precision and manipulation of all diagnostic and technical aspects of endodontics. Allowing for predictable pulp chamber visualisation, the investigation of calcified anatomy can be conducted safer, with reduced loss of tooth structure, minimising iatrogenic incidents. The Cone Beam CT scanner we use is the Gendex CB500 I-CAT scanner which is specially designed for dental use. This is an extremely safe machine with probably the lowest radiation dose of any machine available in the market. As a comparison to an hospital dental CT scan, it emits approximately 10% of the radiation dose. A small volume CT scan can be taken for the complicated cases which require an extra investigation for successful outcomes. The new NSK advanced digital apex locator accurately measures the length of any Root canal, including dry, wet and bloody canals, and eliminates the any problems associated with using an analogue locator. The Obtura Heated Gutta Percha system rapidly fills even the most difficult root canals more effectively, in less time, and with less patient discomfort than any other method. This lady presented with symptoms of apical periodontitis (dental abscess) associated with lower left first molar (LL6). 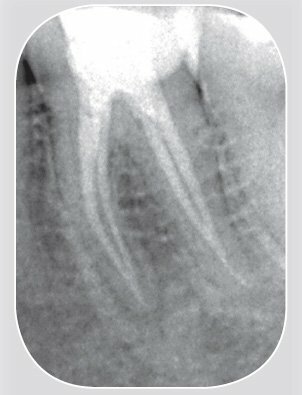 Pre-operative radiograph examination revealed recurrent caries (decay) beneath the composite filling. Removal of the filling has enabled adequate caries removal and root canal therapy. This gentleman was referred with a view to retreating lower left first molar (LL6). 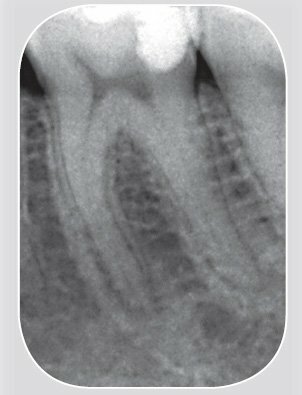 Pre-operative radiograph shows inadequate root treatment with associated chronic apical periodontitis. 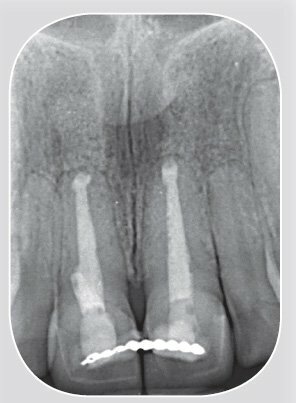 The tooth was retreated with nickel titanium rotary instruments and root filled with warm vertical condensed gutta percha. 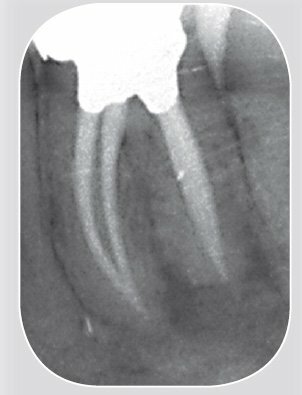 It was restored with an amalgam Nayyar core and the final indirect restoration was carried out by the referring dentist. This 26 year old lady sought guidance from an orthodontist with regard to her malocclusion. He subsequently referred her to us for an assessment due to her multiple problems. Radiographs of the upper central incisors revealed fractured and corroded silver points apically along with large apical lesions. Orthograde re treatment followed by a surgical approach to seal the canals with MTA has resolved apical pathology. Following apical surgery she underwent successful orthodontic therapy to correct her malocclusion. This gentleman was referred by his general dentist for root canal therapy of tooth UL6.The treatment was complex and required the use of a surgical operating microscope. The patient had been experiencing pain from UL6. A thorough history of the pain was taken and any relevant medical conditions noted. Appropriate digital x-rays combined with the patient’s history allowed a definitive diagnosis to be made. The possible treatment involved either extraction or root canal therapy of UL6.Mr X opted for root canal therapy. The patient was informed of the procedure, prognosis and any associated procedural risks were discussed. Any questions the patient had were answered and he was given a quote for the procedure. The treatment was performed under local anaesthetic. A rubber dam (protective sheet to allow clear access, increase patient comfort and allow a safer procedure) was placed over the tooth. The four root canals were located using the surgical operating microscope. The length of the canals was determined using an electronic apex locator. 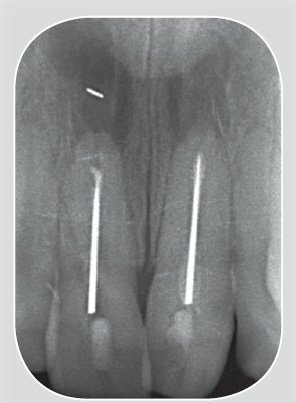 The canals were shaped and cleaned using modern rotary nickel-titanium instruments in combination with the latest irrigants. Once prepared the canals were dried using paper points and filled with a special rubbery material called gutta-percha in combination with a sealing cement. The use of special heat source (System B and Obtura) were used to fill and seal the canals. 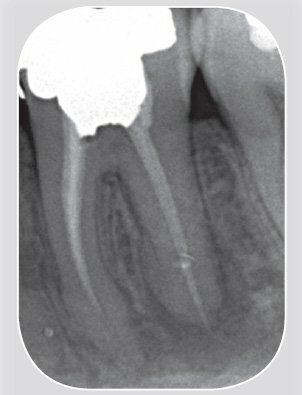 A restoration was placed over the completed root canal and a digital x-ray taken to confirm final fill of the tooth. At 2 week review the tooth was symptom free. The patient was returned to his general dentist for provision of the definitive restoration and continuing care.